“ Corrupt are not human. There is violation of human right every where and the every first violator of the human rights is the Government itself. 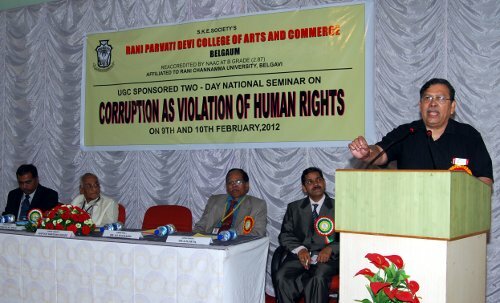 The promotion of human rights is impossible by the people who have forgotten and ignored the very spirit of governance” said Justice Santosh Hegde former Lokayukta while delivering the key note address at the two day UGC sponsored National Seminar organized by S.K.E.Society’s R.P.D.College of Arts and Commerce Belgaum. Addressing the delegates and the students Justice Hegde added that a Nation can not prosper with people suffering from the mass disease of “greed”. He further said that silence has been our mistake, our sin. Let us not repeat the mistake of keeping quiet over corruption, violation human rights. Members of the SKE society were present in large numbers. Is dearness, corruption, injustice not a nice gift to great public of our nation, who cast their valuable vote or nominate the person under influence of caste, subcast, title, relation, friend, religion, money, area, force, self interest, wine & chicken by totally ignoring incapacity/ inability of candidate ? Then for which particular public, Anna & Ramdev are weeping/crying ? When system to change them is already provided in constitution. I think it is the kind of food humans are consuming ,creates havoc for their behaviour. My sincere requests to become Vegetarians with Non Drinking,Non Smoking,No gutkha. Behaviour automatically changes and people will become Gentleman. What logic is this very funny one. The western countries are very corrupt because they eat non vegetarian food or is it the other way. Balanced diet which also includes non veg plus moderate drinking is good for your health. Avoid smoking & guthka as they certainly do harm your health. Good health brings good thoughts.